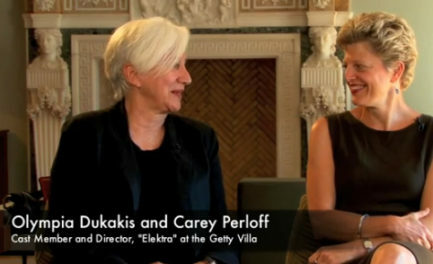 Here at the Getty, hundreds of people — yes really! 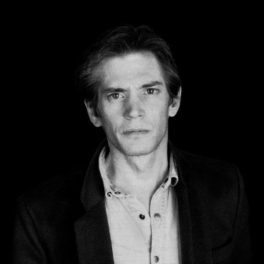 — are involved in creating an exhibition. From the curators who research the show to the security officers who protect visitors and the art, it’s a huge team effort. I wanted to know all of the ins-and-outs of organizing an exhibition, and what role each department plays in bringing a show to life. So I asked! 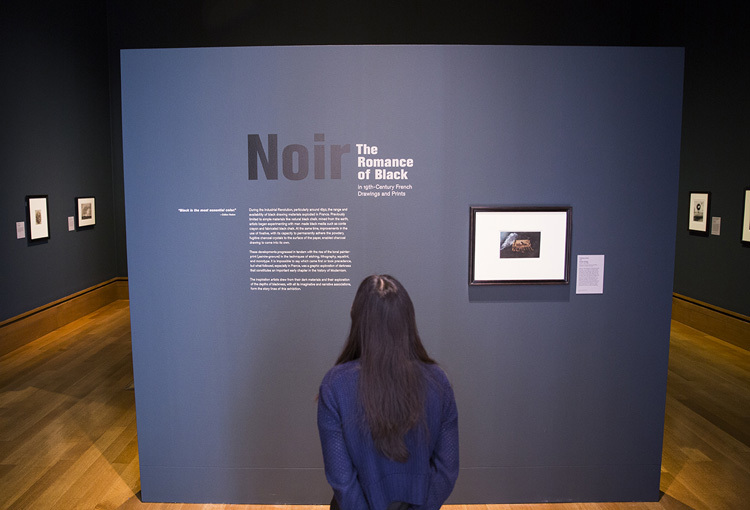 Here’s what I learned from members of four key groups — curators, conservators, registrars, and exhibition coordinators — about planning the Museum’s latest exhibition, Noir: The Romance of Black in 19th-Century French Drawings and Paintings. It began with a landscape drawing by 19th-century French artist Maxime LaLanne. 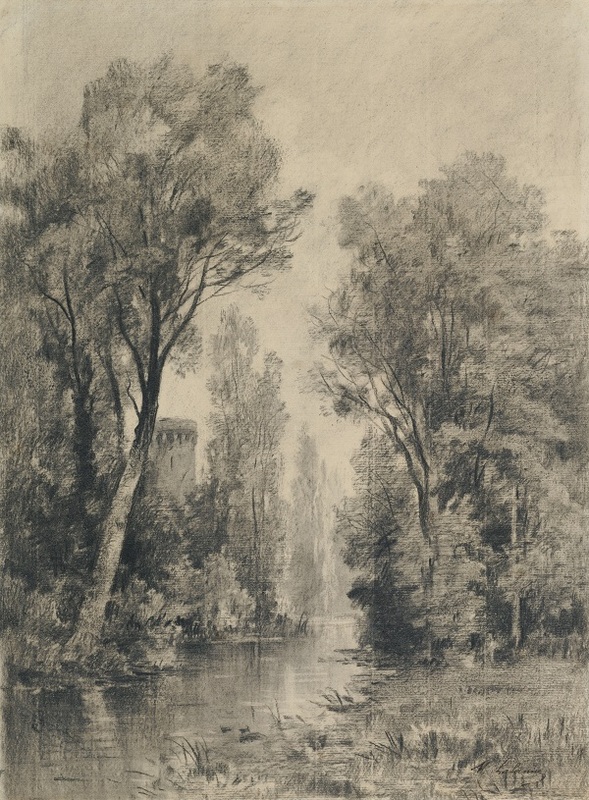 The exhibition eventually expanded to include both drawings and prints, as Lee quickly discovered that these two mediums were inseparable in this time period. Many artists creating black media drawings were also creating what came to be known as “artist prints,” with the same subject matter involved in both mediums. Conservators in the Museum’s Department of Paper Conservation began serious preparations for Noir over a year ago. 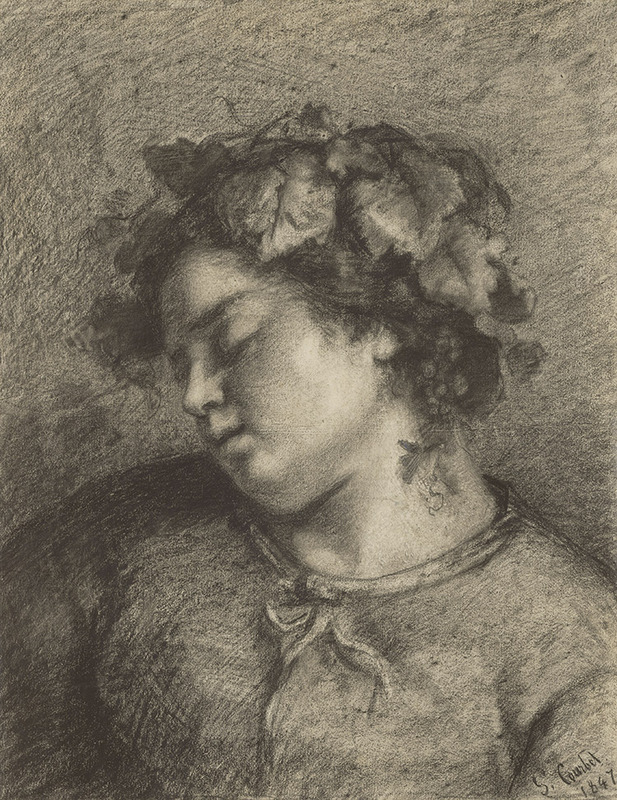 They began by looking closely at the drawings — often under a microscope — to determine specific materials and techniques used by the artists. Michelle Sullivan (left) and Nancy Yocco examine a drawing in the Museum’s Paper Conservation Studio. 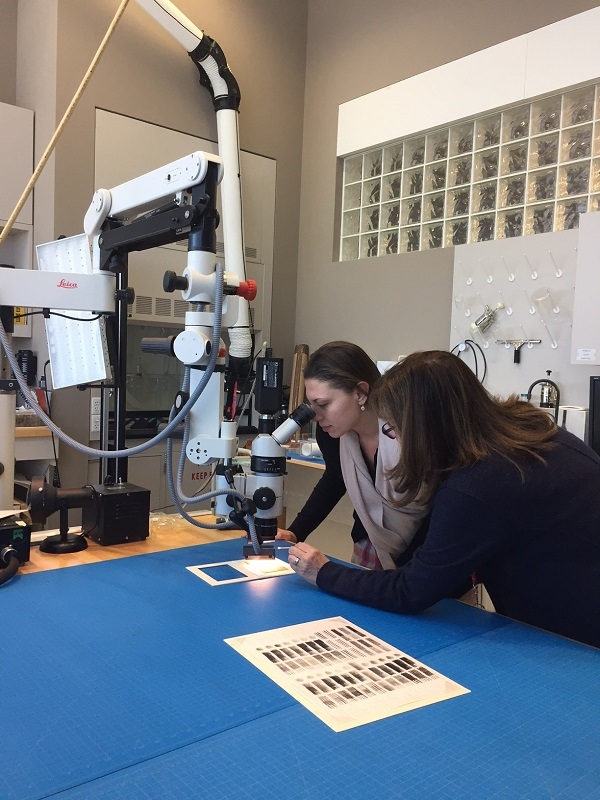 Conservators Nancy Yocco and Michelle Sullivan not only studied the artworks in depth, but also read a lot about 19th-century French drawings. “We want to know who [each artist’s] teacher is, where he came from, and the body of his work. That prepares us to put whatever object comes before us in context,” Nancy told me. Left: sampler of various dry black media found in Noir drawings. Right: photomicrograph of powdered charcoal, observed at 96x magnification. 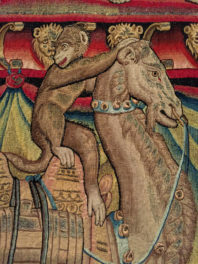 The exhibition itself will feature a strong conservation aspect so viewers can understand the works from both an artistic and a material standpoint. The Registrar’s Office makes sure that all of the art going in and out of the Getty is safe, secure, and ready for travel. 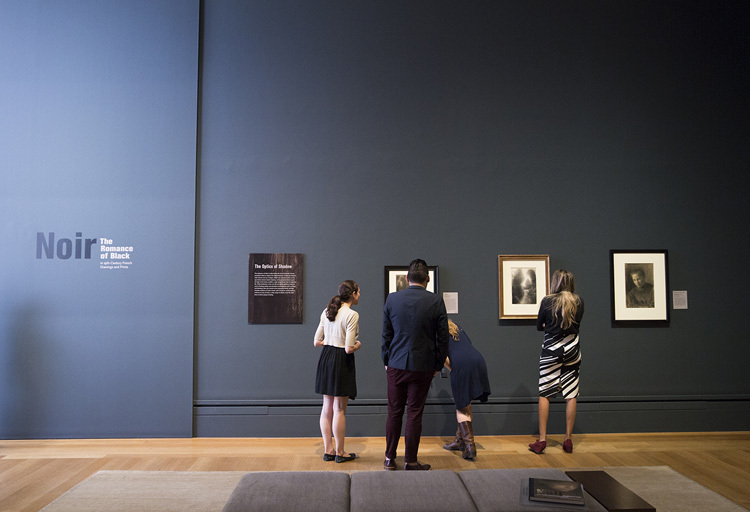 Working closely with the curators and the exhibition coordinator, registrars began working on Noir over a year ago. Registrars also collaborate with conservation staff to ensure that packing specifications are up to the highest standards and all artworks are stable enough to travel. Once the art safely arrives at the Museum, the art preparators (“preps”)—professionals trained in safely handling multiple types of artwork, from massive sculptures to delicate drawings—install the art on the gallery walls. If all of these departments are puzzle pieces that come together to form an exhibition, the exhibition coordinators are the puzzle-solvers, making sure all of the pieces are put in the right place at the right time. They collaborate with all involved departments to make every piece of an exhibition happen. “It’s a lot of meetings,” says Susan McGinty, the exhibition coordinator for Noir. It begins with a budget meeting, where curators propose potential exhibitions at least a year in advance. Once the show is approved, the exhibition coordinator creates a detailed schedule for each department involved in the show. Later on there’s the design meeting, where the look and content of the exhibition is presented to the Museum director. Things like floor plans, paint colors, installation plans, and promotional materials are discussed at this time, to be finalized later after being reviewed by curators, educators, registrars, and many others. 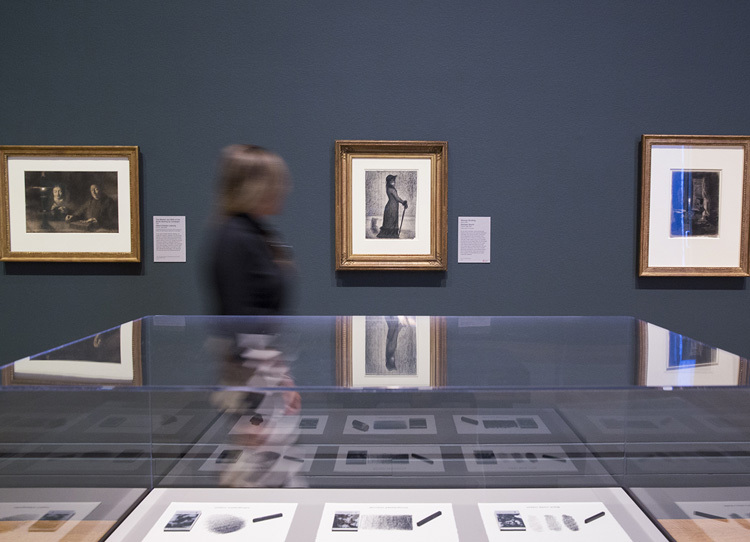 For Noir, additional meetings were necessary to bring together didactic cases, something curators and conservators are especially excited about. These cases contain samples of the types of materials artists used in their works, and allows viewers to “be on the inside” of the artists’ technical processes. Once all of the materials are ready to go — the art, wall labels, promotional materials, video/multimedia installations, and the hundred other things that make up an exhibition — the art preps, curators, conservators, registrars, and exhibition coordinators gather for the art installation, which can take anywhere from 2-3 weeks. I'm an art historian and a 2015–16 graduate intern in the Public Affairs Department of the J. Paul Getty Museum.